Iowa Senator Chuck Grassley says he would support President Donald Trump sending armed troops to the U.S. border with Mexico to stop what Grassley calls an “invasion” by a large caravan of immigrants. As many as 7,000 people, on foot, are headed northward to seek asylum. Grassley says soldiers would be deployed to the border — as in the past — to support U.S. Border Patrol agents. Some critics of using troops fear the potential for a civilian bloodbath on the border, harkening back to the Kent State shootings in 1970. 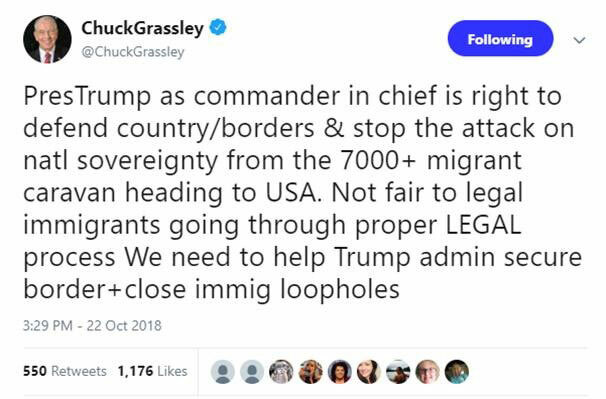 Grassley says Trump is justified in his threat to send troops to defend our nation’s southern border and to stop what Grassley describes as the “attack on national sovereignty” from the caravan. On Monday, the president vowed to cut off or greatly reduce U.S. aid to nations like Guatemala, Honduras and El Salvador if they don’t find a way to stop their citizens from trying to illegally enter the U.S.
Iowa Congressman Steve King suggests President Trump cut off all U.S. aid to countries along the route if the caravan reaches the U.S. border. King says money saved could be used to build a wall.